« Tribute to a good friend: Bon voyage, Darren! On June 25, 2009, Jeff and I had coffee with Claire. 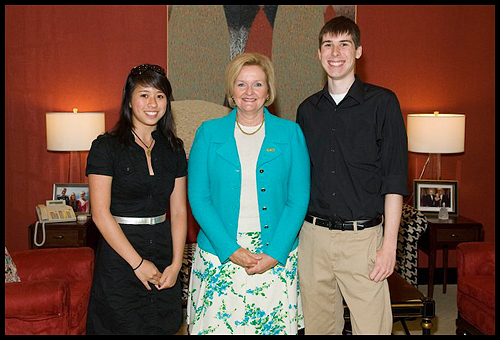 L-R: me, Sen. McCaskill and Jeff. This photo was taken by an official Senate photographer and e-mailed to me from Sen. McCaskill's office. Jeff does not look this awkward in real life... generally. U.S. Sen. Claire McCaskill, D-Mo., has 9 a.m. coffee with constituents every Thursday while the Senate is in session. Upon learning of this weekly meeting via Twitter and finding out that I would generally have Thursdays off during my internship at washingtonpost.com, I knew that Jeff and I had to visit with Sen. McCaskill at some point. Some slight exaggeration may be involved here, but I partially credit Sen. McCaskill for embroiling me into Missouri politics and, what the heck, political reporting in general. 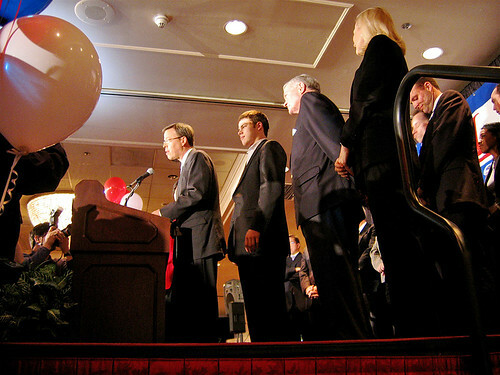 At the conclusion of her 2006 campaign against incumbent Sen. Jim Talent, R-Mo., The Maneater student newspaper sent two teams of staffers to St. Louis on Nov. 7. That was election night, and reporter James Patrick Schmidt and I were onboard for Jim Talent’s official event in a swanky hotel. It was my first time covering any kind of political event. My editor had offered me the assignment, which I couldn’t refuse even though I had no prior knowledge or interest in anything political. Once we arrived in the hotel ballroom, I felt like I was swimming through uncharted waters. I had to approach a kind-looking, well-to-do woman and ask her to point out major politicos such as Sen. Kit Bond, R-Mo., and Lt. Gov. Peter Kinder. But I caught on quickly. And the adrenaline rush I experienced from all this was thrilling. It carried me from the start of the evening all the way through the 4 a.m. drive back to Columbia (during which JPS, Joel and I sang “99 Bottles of Beer on a Wall” all the way through and saw the sun rise behind us on I-70). Needless to say, Talent lost the Senate seat to McCaskill. But even though my photo of Talent’s concession speech (see below) didn’t make the Maneater‘s front page the next morning, that night was the beginning of my love affair with political reporting. The photo that ran inside The Maneater the next morning. I gotta say - as a little freshman photographer, I felt so cool standing alongside real photographers who had big lenses and flash units... while I pointed and shot with my then-trusty point-and-shoot Canon PowerShot A95. But hey, we all have to start somewhere, right? Two years later (fall 2008), I began a full year as a full-fledged student reporter in the state Capitol Building press bureau. And boy, did I love it. And boy, do I miss it. And in between, I took advantage of many opportunities to cover more political stories, including major presidential candidates’ primary rallies, Blunt’s last State of the State address and much, much more. So, in a way, Sen. McCaskill is to blame/thank for introducing me to (Missouri) politics. And, in the interest of bipartisanship, thank you, former Sen. Talent.